Winship's Anand Jillella leads a trial that reduces mortality rate for patients across the country. Winship's APL team (left to right): Martha Arellano, Kaitlin Sitchenko, Anand P. Jillella, Vamsi Kota, Ann Shen, Emily Bennett. Winship oncologist Anand Jillella is spearheading a clinical trial for patients with Acute Promyelocytic Leukemia (APL) that could change the mortality rate for this disease on a major scale. Often called the heart attack of leukemias, APL is a highly aggressive disease that is curable if treated early. A third of patients, however, do not survive the first month of treatment. By observing and analyzing the problem, Jillella and his team of physicians, nurses, and research staff came up with a collaborative approach that decreases mortality from 30 percent to about five percent. This new trial is open to patients all across the country. Jillella has found that some physicians who treat patients with APL may not be familiar with the potential complications that can develop during treatment. He took a very detailed treatment algorithm and boiled it down to a three-step process that can be easily shared. "As soon as we get a call from a community physician, we send the simplified algorithm via smart phone," says Jillella. "We come up with a treatment plan based on what the patient is experiencing and follow up with them regularly to get them through that difficult first month." Why are some individuals more likely to develop cancer or to develop a more aggressive form of cancer? Why do some people not get the care they need, when they need it? Winship clinicians and researchers confront such disparities daily - and are working to understand and change them. Winship's Dan Brat is the lead author of a groundbreaking study that will change the way brain tumor patients are diagnosed. Long-standing support from the Woodruff Foundation has allowed Winship to expand access to two Emory Healthcare hospitals. Winship Deputy Director Fadlo R. Khuri to lead American University of Beirut. $3.5 million award to be used to help gain new insights from cancer imaging data. Georgia's only pediatric radiation oncologist is going overseas to train others in improving patient care. Three key positions are filled by familiar names. 5 Questions for Walter J. Curran, Jr.
Winship's Executive Director talks about some key issues. 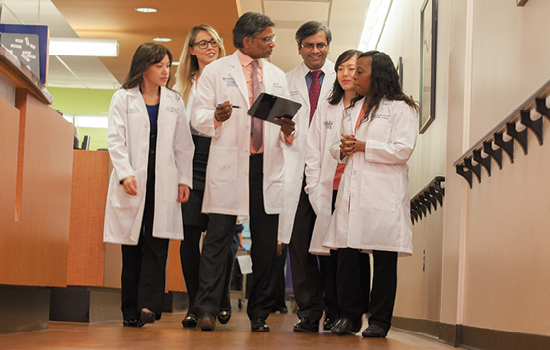 Supportive oncologist helps patients take a big step in their cancer journey. The 2015 "Fashion a Cure" event saw a big boost in donations.